So, hubby went to help his friend manning the DAP booth because they only have 2 ladies there to check the electoral roll manually and one man to foresee the rest. There are elderly people who needs help to get down from vehicles, shown to the voting booth (because there are two polling stations side-by-side) and even old aunties looking for toilet needs to be accompanied etc. The most humbling experience I had was this lady. She is very old, very frail and she came from far to vote. She came by bus and after walking around to look for her polling station, they told her she had been transferred to town area. DAP has very few cars and they can’t go down to town. So, they hunt around for someone to drop the feisty old lady because she wanted to take a bus there. All the DAP cars are voluntary services but I heard Barisan’s cars owners get paid. Finally, we managed to get her to go down town to vote. She was still cussing why she need to change polling station. Now I know for sure those claims that people were moved around are true. I am not sure what’s with all these old ladies but they really go out of their way to vote. And they are diehard fans of DAP. I am not sure why too. Several out of town people also came to the DAP booth to find their electoral roll and they said they purposely come back to Penang to vote. As for the Indians, they have this support for DAP that bowled you over. They wear red. They refused to stop at the Barisan Nasional MIC booth. Oh did I tell you there are actually three Barisan Nasional booths? MIC, UMNO and MCA! They purposely walk a distance just to get to the DAP booth to check their stream. And I greeted them with a MAKKAL SAKTHI! which sealed the votes. And here’s the kepoh 5xmom tumpang duduk. If I look fat, it is because there is another lady in red behind me, ok? Hahaha. I took my laptop there to access the SPR site using my Celcom wifi. Didn’t need to use it much but still, at least I got bloggable materials sitting under the tree. And I can tell BN’s booth, my computer is pinkier than yours. Hahaha. Overall, it has been a fun activity for me as a blogger because I get to actually hear and see the sentiments of the voters. They are very vocal. A Malay policeman came on bike and told us, “Kita kasi roket naik!” I asked him, “Wuah…bukan semua polis kena pangkah biru punya?” He said, “Tarak lah….and showed his face.” Another Malay man chatted with hubby that he too has enough. “Kita orang susah mana UMNO ada tolong?” And the funny thing is those Barisan Nasional voluntary drivers passed by and gives us the thumbs up. LOL, they are taking BN’s money to drive the car but their heart is somewhere else. I must make a disclaimer that I am not attached or related to DAP. I am making my observation as a voter and a blogger. And red colour suits me so I tumpang duduk at the DAP booth to listen to DAP supporters talking about the CM of Penang, how Lim Kit Siang lost his seat with a majority of 140 votes (or is it 104?). I got to know how counting is done and many other dirty stuffs not mentionable here. HAPPY BIRTHDAY, SAMY VELLU. I worry for you lah! I cannot describe how Indians have totally lost faith in BN because of you. If the Opposition wins big, it is all your fault, Samy. Read this article from Malaysiakini that further sealed Mr. Blue’s fate. Damn, I am so excited about the Malaysia election results. You bet that I will be glued to the TV for updates and have the laptop on my lap to write as they are announce. Next Next post: Where to get the latest election results? So yau yeng!! Hehe.. I ended up pakai red also… ‘coz got EPL match this weekend mah, how can I not support my MU.. Jokes aside, I heeded DAP’s call to wear red to show how pissed off I feel about things. Keep the updates coming! My Dad will also be heading to the vote counting centre later to tolong tolong. yay!! finally a way for me to get ‘live’ reports. 🙂 my house’s tv broke down, was busy hunting down websites that may have live feed of the election results. btw, for overseas Malaysians, is there any way to get live election results? How come you so like that one? Ucap happy birthday to the Sami Blue but to your loyal reader? Mai ka lu ho liao? Oh yes.. tell you something. I never see so many cars on the road on Saturday and many ppl at the polling centre. I guess tonight we are going to make history. Having been reading your blog daily….very informative esp. during this election time….Hey! 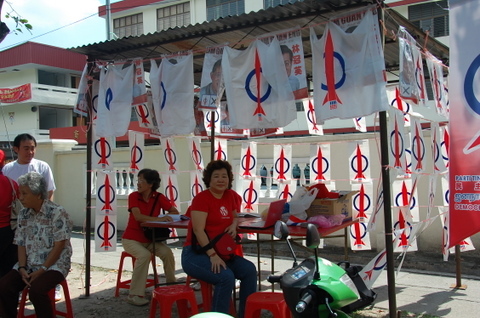 while I was passing Shang wu school just now, I saw a few ladies in red at the DAP booth. On second look I tell myself..Eeh! !this lady must be the famous blogger Lilian. It must be her. when I came into the office…went to your blog as usual and confirm its u…Keep up your good work…we r all for the Opposition…..God bless we all vote wisely. kew – Wuah, heavy rain liao!!! Chialat. choonie – AIYOYO…I forget liao cos too kepoh. HAPPY BIRTHDAY! CIKGU. Victor – I doubt there is a live streaming but let me hunt around and if there is, I will post it. silvaraven – Can listen to radio too. But TV will be good. I wanna see Samy cries. angie – I hope they stepped up the observers numbers so there are no hanky panky hor? If not sure frus lah. #2 – Can…What ever you do, don’t ever be a politician enuff. Just cast my vote at SK Batu Lancang. I wore red at first but my mom was afraid I would kena whack by some BN hoodlums so had to change (last election my friend’s car, with a huge DAP flag on it, got smashed). Never seen soooo many people rushing to vote before. It’s a good sign. Btw, this maybe old news, but yesterday some Riffle Range residents said they got RM60 each for attending the BN ceramah over there. 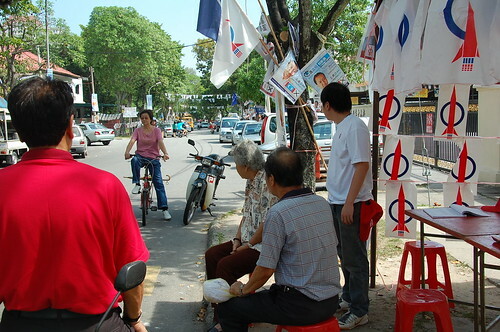 They told me they kept RM50 and gave RM10 to DAP at the DAP Ceramah at Han Chiang. 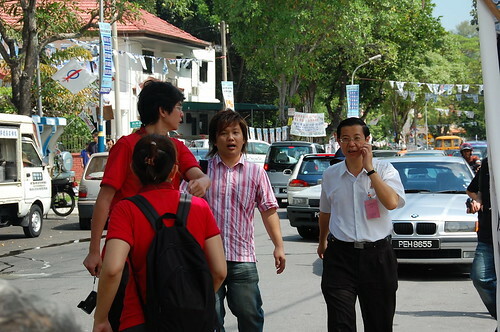 Rumour is around that Jeff Ooi was “hold up” by BUKIT AMAN … HE IS STILL IN PENANG! HE IS OK. STILL AROUND IN PENANG!!! JOM UBAH ! I’m from Kuching. yess………….most voter wear red and me too. when i reach polling centre. BN ppl dont want to greet me n pull long face cos I’m wearing red, wooohoooooohooooooo……..
DAP get 16 votes from my family. yeahhhhhhh…………. LOL!! This time round, I saw at least 2 observers per room. The last round, I saw 1 only. Probably because we were voting for the DUN only. That time, Parliament seat was uncontested. Anyway, check out my blog. I kena spam motivation from our gahmen…. When I went for my voting, there were no DAP booth there. Only BN. But good things don’t need to show out. We, the RAKYAT eyes are very clear now and we know what we want already. Ya, I can’t wait for tonite result too. Lagi mau go for wedding dinner tonite. Lawrence ask my cousin to update him from time to time. Sipeh gila one. Hahaha…………..
Wahahaha.. I wore 100 percent ANG ANG eh baju today too. Hi Lilian, well done. I voted this afternoon for change at the damansara utama constituenc. our country badly needs change and to rid itself of all the ills that have afflicted us last 50 years. Hats off to Penang lang for leading the tsunami for change.. with a BR govt in Penang and a BR govt in Kelantan&Trengganu, the people can show the arrogant BN how to govern and be accountable to the people. I am also full of anticipation, and cant wait to hear the good news of the tsunami for change sweeping our nation from Perlis to Sabah.. Thank you Lord for hearing the voices of your people.. Both my votes to opposition, PKR and DAP ! Enough is enough, BN and all their lapdog party (MCA, MIC, Gerakan) are just too much and useless ! Alleluia,.. the change tsunami is sweeping the country. Penang has a new government. Dare we hope for more upsets.. Hats off to all Malaysians for votting for this change. Thank you Lord for hearing the voices of your people..
We pray that the new Penang government will lead the way to show the arrogant BN government how the state should be governed, and what is the meaning of accountability. We pray the DAP/PKR/PAS government will always listen to the people and govern with dignity and responsibility.